I’ve got 10 Crochet projects I want to complete throughout 2019. I set myself 6 goals this year and one is to continue learning to crochet. I figured the best way to ensure that happens is to set myself 10 Crochet Projects for 2019. My confidence has grown a lot over the last year when it comes to crochet. I’ve stopped panicking it’s beyond me and giving most patterns a go, knowing if I mess up I can simply start again. 1. A Tulip – This is for Checka as she kindly bought me new crochet hooks enabling me to crochet easier and with less pain! 2. Grumpy Care Bear – This is for Hannah as she loves Care Bears and when I spotted the patterns I just knew I had to try and make one for her. 3. A blanket – There are so many gorgeous patterns though, it’s going to be tough to pick one. 4. Dobby – Eva loves Harry Potter and she loves Dobby, I want to make her a Dobby of her own and a mini sock to go with him. 5. A cushion – This will be for me, our sofa is horribly uncomfortable so a few extra cushions should help and keep me busy. 6. A unicorn – OK maybe a few of mini unicorns for my girls and one for one of Checka’s daughters too. 7. A pig – Another one for Checka as one of her daughters loves pigs! 8. An aeroplane – I spotted a pattern for an aeroplane and love it. I want to create more items for boys and the first will go to Checka’s little boy. 9. Jesus – Martyn’s choice, I’ve yet to attempt people so this will be a fun challenge! 10. Finally, a Donkey – Again for Martyn as he loves them. I’m really looking forward to challenging myself over the coming year with my 10 crochet goals. Crochet has become quite a comfort for me, on my bad days I can still feel like I’m achieving something. Each make on the list is different and different levels of difficulty and I know I’ll learn a lot along the way. If I finish all 10 projects with time to spare then I’ll probably try to fit a few more in too! Do you have any crochet goals this year? 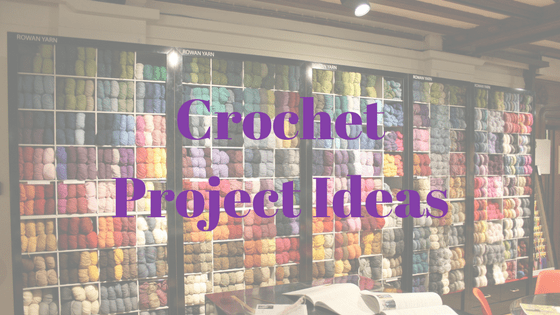 I’m pinning crochet project ideas constantly lately! With some lovely new yarns the Mr has found I’ve been on the hunt for crochet projects. Crochet and blogging have been helping me stay sane lately and I am busying myself with them. So much has been going on lately that it’s been great to have projects to busy myself with. I feel quite cut off lately with no phone, I can’t chat online as much. Thankfully my surface does follow me around the flat but it’s really not the same. My brother pops in once a fortnight but otherwise, I barely see anyone so keeping busy is good. The best part is there are no deadlines, I just do as much as I feel I can when I can. I am almost finished with my huge granny square blanket and know I will need something lined up to make next. Excuse the mess in this photo, it’s hard to get a picture as it is so large! Plus, I have kids… no further explanation necessary! 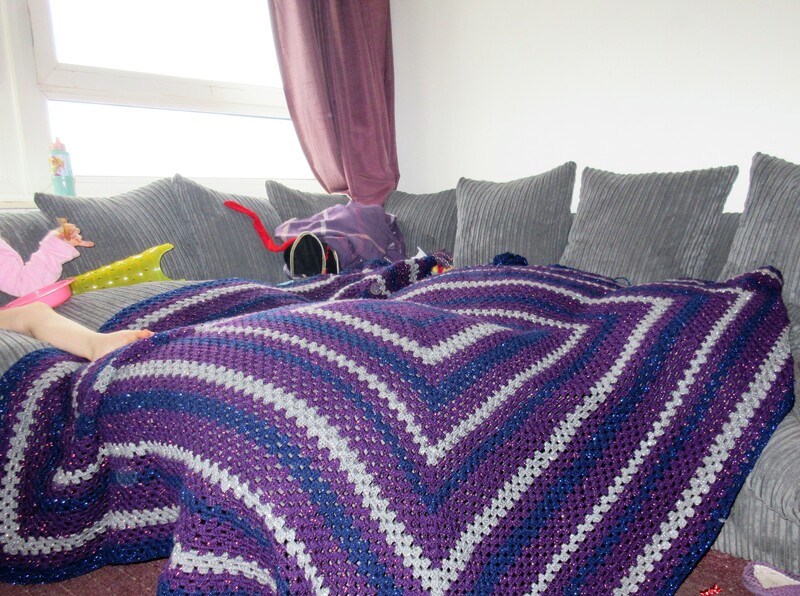 I’ve somehow managed to crochet 150cm/180cm squared, hopefully, it won’t take too much longer! I really enjoy having a simple project to do even though it is huge and taken quite a while! I fear I will miss this project though so lining up a few more projects! I have been looking and pinning so many crochet project ideas that half the time I genuinely have no clue what to start next! I started hunting for some ideas ready for when the blanket is finally finished and found a few I’m tempted to try. 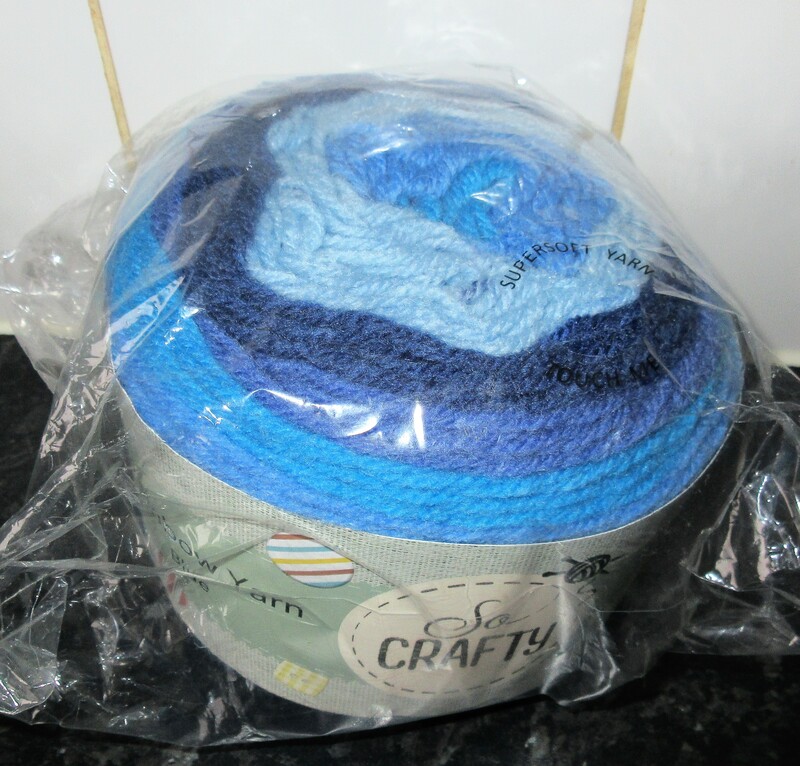 I have this gorgeous yarn cake in blue that I think will make up some lovely socks. I’ve never attempted crocheting socks before so I am a bit nervous. It could solve my cold feed issues though and Heather has pointed me in the direction of some great tutorials. Knowing I have the #HGDCMakersMoment chat on a Wednesday also gives me a boost to find projects. Chatting to other makers motivates me to finish and find new projects. 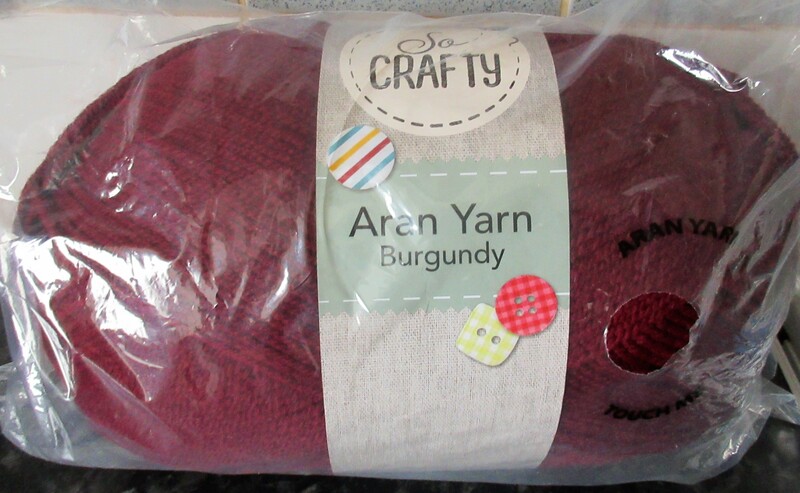 With the Burgandy Aran yarn, I am hoping to start a granny square cocoon cardigan. There are some lovely patterns out there but this one from Spoons & Hooks looks fab. She recommends using 1000-1250 yards of yarn for this granny square cocoon cardigan. I currently have 850 yards of Burgandy Aran Yarn. I figured since I need a size 6-8 I will give it a go and see if I have enough yarn. At worst I can make it for Eva instead although I may keep an eye out for Aldi too just to make sure though! 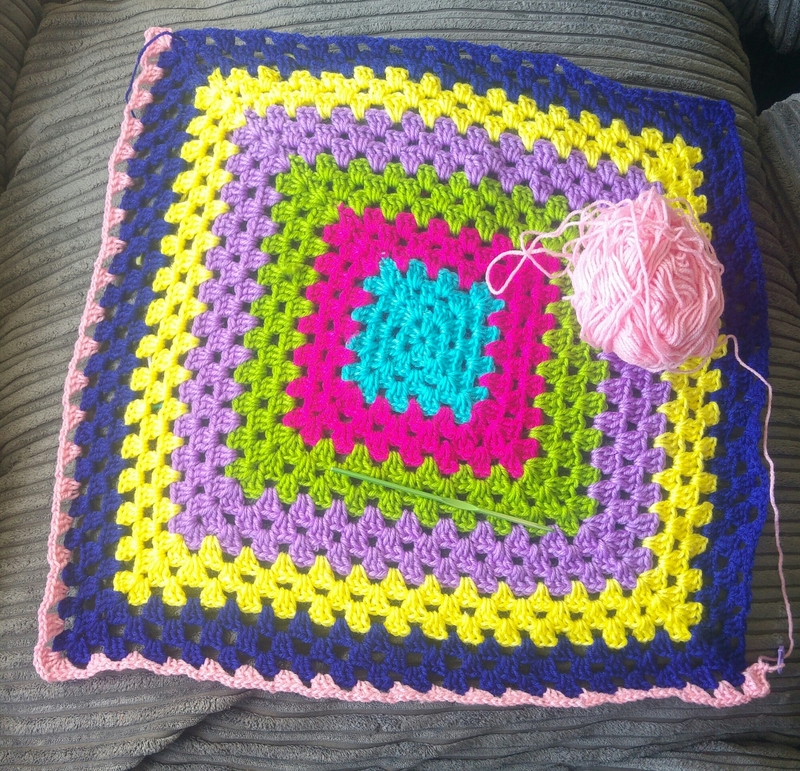 I’ve started on a Granny square project after losing my motivation for a little while. I got the Mr to help me make a cheap & simple blocking board to help me keep them neat and got to work. The last few crochet projects I’ve done have been quite big and I struggled to stay motivated so I needed something simple and easy to put down. Izzy picked these 3 colours to begin with. Of course I haven’t done any of the important things, working out measurements, how many square I will need etc. For now I’m just going to enjoy getting lost in making lots of small squares. Working on a project in pieces like this is much more doable when you have children interrupting. I can make a square in around 15 minutes with interruptions! The small piles above quickly began to grow! I like the fact I can take a ball of wool & a hook out in my bag again and work on the go too, maybe now my phone will stop dying before I get somewhere? Maybe not.. especially if I’m taking pictures as I work too. Either way I’m enjoying doing something, even though it’s for the girls it gives me a nice sense of achievement with each completed square. I even treated myself to a new hook to pop in my bag for crocheting on the go! I’m quite liking the colours Izzy has chosen light sparkly pink, dark sparkly pink, turquoise and this lovely light purple Izzy picked up in QD. I’ve been working on these granny squares for just over a week now. So far I have build up a stash of over 20 squares in my spare time! My squares are a bit neater than before, I’m definitely getting the hand of crocheting a little tighter. Hopefully it doesn’t take too long for my stacks to grow so I can begin stitching them together and working out how big to make it & find a nice edging for it too. What are you working on at the moment? What Granny Square projects have you made? I’ve been getting a bit stressed again recently and as always I’ve fallen back on Crochet to help me through. It really is amazing how calming crochet can be, especially when you are familiar with the stitches/pattern. I knitted a fluffy blanket for Izzy last year & Eva wanted a blanket of her own. With limited funds I haven’t managed to find any really nice soft fluffy wool/yarn for her but thanks to my friend adding to my stash I have started on a simple blanket for now so she doesn’t feel left out, especially with winter nearing and our love of sofa days with pillows, blankets, TV, books & hot chocolate! Eva loves anything reallllllyy colourful (hence loving her colourful crocheted bag!) so I suggested making a blanket up out of lots of different colours/shades, which she was quite excited about. I’ve been working on this blanket on and off and finally picked it back up again this week, mostly as Izzy keeps telling me I need to… ‘MUMMY! SIT! ROUND AND THROUGH! SIT!’ haha! Eva wants me to incorporate the cupcake stitch I recently learnt somewhere in the blanket. I’ve been doing 3 rows though. Cupcake stitch is 2. What do you think? Maybe I could use some more of the colourful wool to blend it all together? Do you crochet? If so, what are you currently working on? Or thinking of starting? Somehow over this summer holiday I have managed to fit in a little bit of crochet in between the chaos and been trying to challenge myself a little more. 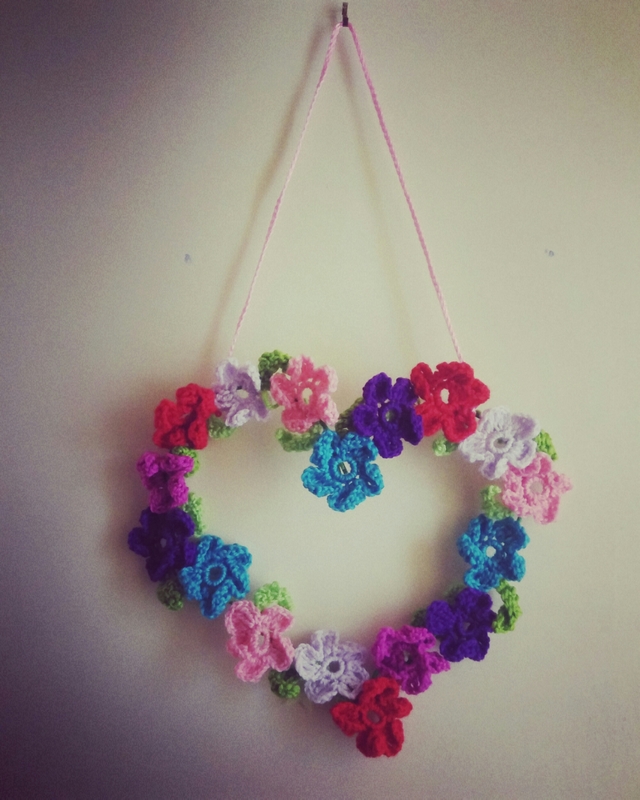 My first project was the crochet flower heart wreath Eva had spotted over my shoulder whilst I was scrolling through Pinterest. I hunted around the flat and found some gardening wire to make the heart shape and quickly got to work crocheting 18 flowers & 18 leaves, letting Eva pick the colours and sequence of the flowers. Next time I will use thicker wool/yarn to make the flowers sturdier and a sturdier wire too as it is fairly floppy but sits well once hung. Eva decided she didn’t want any buttons or extras added in the end and it is currently hung up on her bedroom door. I really enjoyed making the wreath and definitely want to try a few different ideas soon! I also managed to crochet Izzy a little handbag big enough for a fruit shoot & crisps/fruit bag for walks to the park which she seems to love! I’m really enjoying getting creative with crochet but only knowing the basic stitches was starting to bore me so I decided to have a look around and find a new stitch to learn. After a little look around I decided to try out the 4 point star stitch (Marguerite stitch) which is really easy once you get the hang of it and look lovely! My first attempt was quite loose but with a different hook I think it will look much better now I’ve worked it out. I love how quickly you can learn a new stitch especially with such great tutorials on the internet! I decided to start again with my favourite hook and was much more pleased with how the 4 point star stitch turned out.. What do you think? Have you learnt any new stitches recently? What’s your favourite stitch?